Our guests arrived at lunch time and embarked from the pontoon which is conveniently situated just beside the Oban Yacht Club. It was interesting to note that Judys baggage included artists materials, (brushes, paints, sketch pads, etc) . It was quite a thrill knowing that we had an artist aboard for the next few days. After the safety briefing we cast our lines and headed down the Sound of Kerrera to Puilladobhrain, (pronounced Puldoran), a short distance South in order for everyone to find their sea legs! 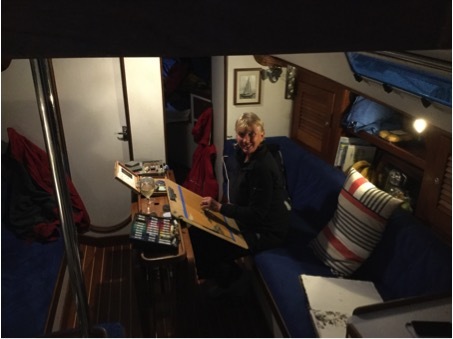 After dropping anchor our guests went ashore for a walk and Judy found a spot where she could do some sketching. The diving kit was again put to good use to clear a jelly fish from the cooling water inlet for the engine. Heading across to Mull the next day we spotted the well known 18thcentury humpback bridge popularly known as “the bridge over the Atlantic” this bridge spans the water between the Isle of Seil and the mainland. 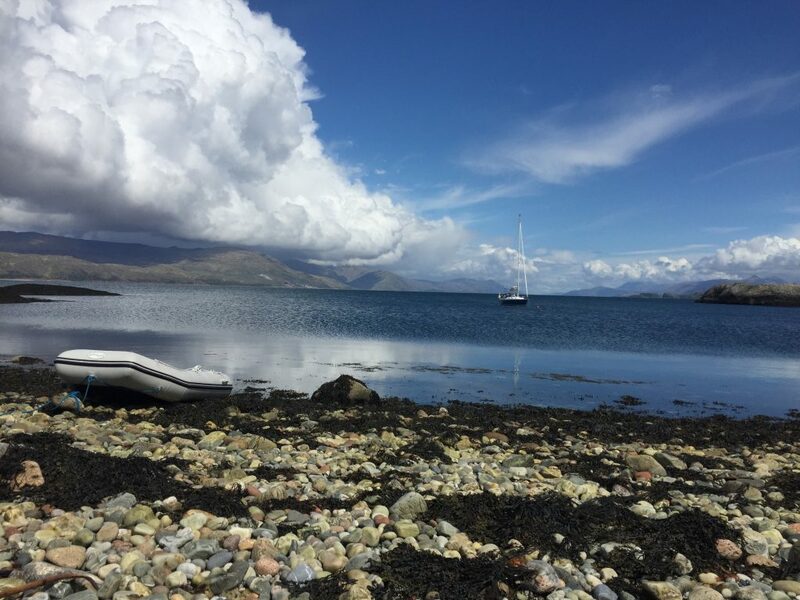 We enjoyed sailing against a fresh breeze up the Sound of Mull and Matts enthusiasm, experience and agility was an asset to the crew as we tacked upwind arriving at our destination of Tobermory at 1600 hrs. Dinner was prepared while the guests explored shoreside and no doubt exercised some retail therapy in the interesting shops which add to the charm of Tobermory. A peaceful night was enjoyed lying alongside the marina berth next to the famous Dutch racing yacht “ Flyer”. After breakfast the following day we sailed Bluebird across to Loch Sunart where we were treated to some close encounters with a large group of dolphins. They mimicked the boats speed through the water perfectly as Bluebirds speed changed in the variable breeze. After a relaxing lunch stop in Loch Drambui and without starting the engine we drifted out through the narrow entrance again with dolphins all around as they tried to catch the fish leaving the loch. Then the breeze picked up a little enabling us to sail down the 18 mile stretch of the Sound of Mull to Loch Aline on the mainland coast where we spent a quiet and cosy night sheltering from the rain outside at the delightful small marina with all its modern facilities. Due to boisterous weather conditions the next day we reduced sail and went round Duart point with its impressive 13th century castle perched on top then with some careful pilotage managed to sail through the narrows and into Loch Spelve. This is the place for fresh mussels and as our crew were fans of moules mariniers we sent a shore party to procure some newly processed rope grown mussels harvested from the Loch earlier in the day. Day five dawned wet and windy with high winds forecast and poor visability so we delayed our departure from Loch Spelve until conditions moderated. Judy was content to do some more painting while the skipper entertained the troops with some live guitar music and song. The return sail back to Oban went well and the charter guests disembarked at the pontoon again. Thank you Judy, Mark and Mathew for signing up on Bluebird this year. The cruise was truly amazing and made so much more enjoyable by your company.